For the first 10 months of the year, Young’s home—a pre-war apartment in Chicago’s Gold Coast historic district he shares with his husband—is quite possibly the antithesis of what one might consider an eclectic, festive space. He calls his living room “a sea of cream”: tonal neutrals peppered with the occasional amber or saffron accent. This design ethos is one that rings particularly true for the holidays. Young, a self-professed Christmas devotee, goes all-out with the nostalgic decor. You won’t find sleek baubles or simple metallic accents in this house. Instead, the traditional, festive decorations are ceremoniously deposited smack in the center of the room; undeniable focal points that, when set against Young’s more pared-back quotidian aesthetic, really pop. The guests of honor? Young’s antique ornaments, which he started stockpiling when he was five—now, the collection surpasses 1,000 pieces. He’s spread them out between the three trees in his home (one in his bedroom, one in his art studio, and one in his living room) and each one serves as a sentimental reminder of the holidays. If you, too, are a holidays junkie who’s ready to break out the wreaths as soon as the pumpkin pie is put away, keep reading. 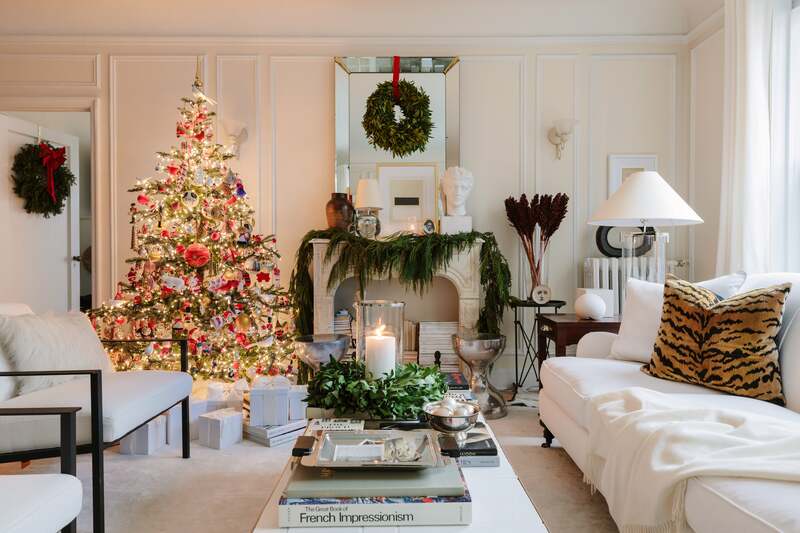 We spoke to Young to learn more about his unique approach to Christmas decorating and to get his tips on creating the ultimate festive home. [The ornament collection] started when I was a kid because of my late grandmother, Rose. When I was a kid, I used to walk into her living room, and she would have all these beautiful ornaments, each one unique—actually, some of the things on these trees are hers from the ’40s, ’50s, and ’60s. I don’t think the holidays should be generic. It’s a great time to bring out heirlooms and things you’ve collected over the years. Decorating is a constant case of, “Do you remember when we got this in New York or when we got this in Paris?” It doesn’t have to be expensive, but it creates nostalgia. At the top of the tree, there’s a little mouse on a ladder. That was the ornament my grandmother used as a tree topper for years. As a kid, I’d go to people’s homes, and they’d have a big star or ribbon; she always utilized ornaments in unique and creative ways, and I just remember always being captivated by that and her mentality to think outside the box. It doesn’t have to be expensive. That’s the biggest misconception because, if you look at ornaments from Nordstrom or even Target and start adding those up, it’s super expensive for something that’ll be up for a month. My friends and my husband make fun of me because we’ll be antiquing in the middle of July and I’ll buy ornaments. I love them! People look at [my collection] and are like, “You must have so much money invested in this.” I don’t. I go to antique Christmas stores, and they have buckets of ornaments that are $5 for 20. You can literally find them at Salvation Army. I’m okay with my trees being like this because if you pan over and look at the rest of the house, I’m very simplistic with how I decorate. There’s nothing red or flashy. Even if your tree isn’t the focal point; let’s say you’re in a small apartment in New York and you want your minibar to be your focal point. Use garlands and different colored ornaments and lights and let that have its moment, but let the other things around it breathe. It can get stuffy really fast. I like to use real greenery because I love the smell of it and it brings a very natural vibe to the apartment. I think, for the most part, greenery looks beautiful just as is. Even our bay leaf wreaths we have above the mantel in the living room and the studio just have a simple red ribbon; no huge bows, no ornaments, it’s not anything elaborate. I like to let greenery have its own moment and live without anything attached to it. Something I do every year is set aside a Friday night. I’ll get a bottle of wine, get some Christmas music going, have a nice little dinner, and really try to enjoy the moment of decorating the tree because it’s like bringing back the past every year. Half the time you forget what you have because it’s been 365 days since you’ve seen it, and it’s such a fun moment to just go through everything. I try always try to keep the warmth of the season going. Williams Sonoma is an amazing partner of mine, and we added these hurricanes with candles throughout the home. Adding candlelight to your home looks seasonal during the holidays, but afterward will make winter feel less dull. Especially for people like us—we have mantels, but we don’t have working fireplaces, so it’s a nice way to add warmth to a space. Create nostalgia and don’t restrain yourself to having it be perfect or in line with your current home decor. It doesn’t have to be that way.